The Ohio Statehouse, in collaboration with famed Columbus Jazz musician, Arnett Howard, will present a free concert on Friday, June 10. Summer Fridays at the Statehouse is a FREE lunch-time outdoor performance series that takes place on the West Plaza (High Street) of the historic Statehouse each Friday at noon throughout the summer. 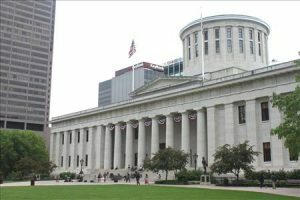 Summer Fridays provides an opportunity for the public and downtown community to gather on Capitol Square to experience some of Columbus ’ diverse arts organizations and to visit the beautiful Capitol building. Columbus ‘ own Creole Funk King, Arnett Howard has performed more than 5,000 concerts since 1985 for audiences big and small, people young and old, in Central Ohio and worldwide. Arnett’s show is a musical concoction of Motown roots, Memphis meets New Orleans Rhythm and Blues, thrown in with Creole, Cajun & Zydeco Dance Music and a splash of Reggae. This performance will be take place in the Capitol Atrium in the event of inclement weather and will not be cancelled. Summer Fridays at the Statehouse takes place each Friday through August 26. Previous post: Bungalow Jazz Shows Return this Friday with Bryan Olsheski & more..